Recently, I was involved in a discussion about how to get the SQL Server based configurations work using the indirect settings; since I have not had the chance of getting into it; I thought it would be helpful to share a technique that yields similar results. 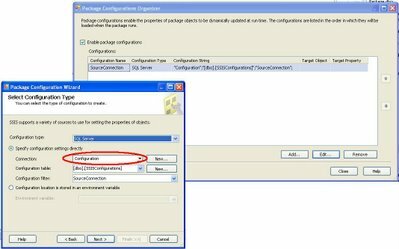 This post describes an approach for implementing SQL Server based package configuration that uses an environment variable to facilitate the deployment of the packages onto different servers without having to modify the packages. I have used this technique for a while, and I think, it may be used as an alternative to the indirect method described in BOL. Since during the development we are pointing to a development DB instance, we need the ability to change the connection information to point to the QA or Production source databases without the hassle of having to edit the package each time. It is here where package configurations come to the rescue. We have decided that the configuration values will be stored in SQL Server table; hence we need to create an additional connection manager that points to the location of our configuration table in the development environment. The name of this new connection manager will be ‘Configuration’. 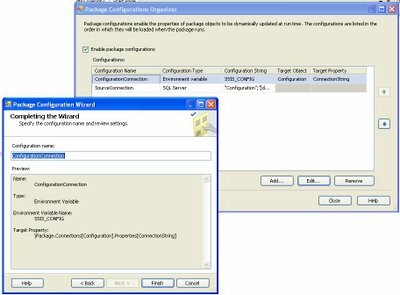 As you can see, this package configuration uses 'Configuration' connection manager to get acces to the Configuration table. On this example the name of the table is SSISConfiguration. By doing this we have turned the package into a very portable one. Going forward, all we have to do, when deploying the packages into a different server, is to create a variable called SSIS_CONFIG in that server; set the proper connection string as its value, and make sure the rows in the configuration table have the right values. I have successfully used this approach using an XML file instead of an environment variable; which comes handy when the use of the second ones are not an option. Please feel free to post your comments. I hope you find this example helpful. you would have to modify the connection strings to point to DBs that exists in your environment. Is that possible to make all your packages downloadable? I am traying right now to find a place to upload the files. If you email me I will forward a copy of the package. I would also like to have a copy of this package (if possible). Can u also send me a copy? That is true; this approach does not fit very well when you have multiple instances in the same server; and to be honest I don't see a clean way to implement a solution under that scenario. I have worked in projects where my Dev and QA environments were on the same server; I ended up using a virtual server to get a clear separation of the environments; not always an option though .Thanks for pointing that out. I would like a copy of this package please. Could I also have a copy of this package please? Or could someone tell me how to create a Connection Manager once I have this SSIS_Config env. variable and the SSIS Configurations table? I am just starting with SSIS. I keep trying this approach but I have a problem because my SSIS connection string value is not set as the environment variable, dont know why..
Ive just found the problem. I havent restarted Visual Studio. Now it works, thanks! Did you Import/Deploy that package to another server? If so which one did you use, and did it pickup the EV if you try to run that SSIS package from within Managment Studio? Wonder if you ever uploaded the file? It's hard to view the setup from this link, thanks. This is all very nice, and there's tons of articles out there on how to create SQL and other package configurations to make your packages portable, but in weeks of searching I haven't found a single thread explaining how to use the variable back in your package! I have a package-scoped variable, User::FolderName that obviously should read the folder name from the package configuration. My SQL package config contains the value (the folder name) I want to use. But, User::FolderName is always blank when I try to run my package. How the **** do you set your package variable to the value in the package config!? In my situation, my dev and qa instances are on the same physical server. Can I use this approach? Could you please send me a copy of the package. Rafael, Is it possible to add encryption in this process, i.e. it would be nice to have the passwords for DB connections encrypted ? I used exactly the method you outlined here, but when using the pacakge from a SQL agent job, I find that the package does not use the Configuration table values at all. Any idea what might be missing? Could this be a permission issue? Can we also give SQL Server username and password in the windows environmental variable? In sql server Configuration approach discussed above No where in the SSISConfig table the name of the package is stored to uniquely identify it.So shall I have to create 10 diff SSISConfig tables for deploying 10 diff diff Master packages? ?